Several Prodigies for Peace award winners with Everett Public School superintendent and board members. Photo courtesy of Everett Public Schools. From an April 12, 2019, Everett Public Schools news release. Snow in February may have delayed the school board celebration, but the joy was still there in April! 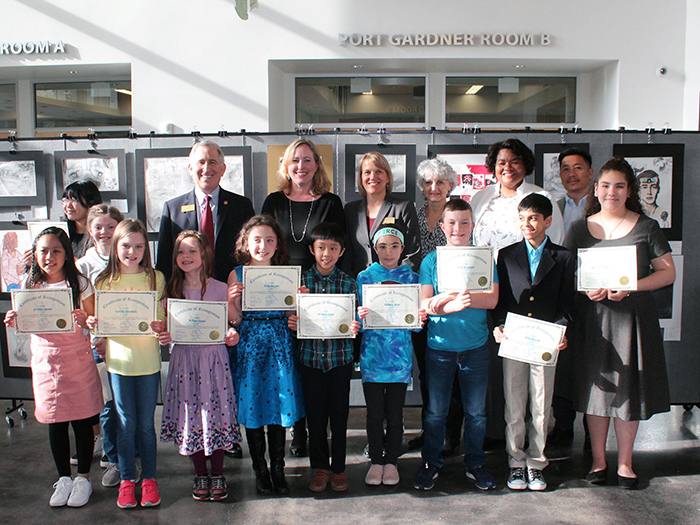 At the April 9, 2019, school board meeting 30 Everett Public Schools students were recognized for earning an award in the 18th Annual NAACP Prodigies for Peace contest. Depending on which category they selected, there were two questions for students to reflect upon. Students stepped up to the challenge of crafting essays or creating art that answered this year’s questions. The Prodigies for Peace writing and art contest helps students draw connections between people and events that shaped the civil rights movement and the social issues that continue to influence their lives today. 1st place – Winston Chen, 5th grade. 1st place – Leah Wilson, 4th grade. 2nd place – Kavi Parikh, 5th grade. 1st place – Shannon Chang, 7th grade. 1st place – Isabelle Rice, 5th grade. 2nd place – Mandi Garvin, 7th grade. 3rd place – Jack Franklin, 5th grade. 3rd place – Kara Popkins, 7th grade. 1st place – Courtney Kihara, 3rd grade. 1st place – Gina Roberts, 3rd grade. 2nd place – Wakelea Barkema, 3rd grade. 3rd place – Madison Campana, 3rd grade. Honorable Mention – Abi Diaz, 2nd grade. Honorable Mention – Katherine Schaffer, 5th grade. Honorable Mention – Rylie Anderson, 4th grade. 2nd place – Annaise Armstrong, 8th grade. 2nd place – Reagan Brandes, 8th grade. Honorable Mention – Makaylla Richard, 8th grade. Honorable Mention – Amber Ling, 8th grade. Honorable Mention – Jaime Jacques, 8th grade. Honorable Mention – Kayla Rucker, 8th grade. 1st place – Damon Cottle, 11th grade. 2nd place – Kira Kuhne, 11th grade. 2nd place – Savannah Segura-Vargas, 5th grade.